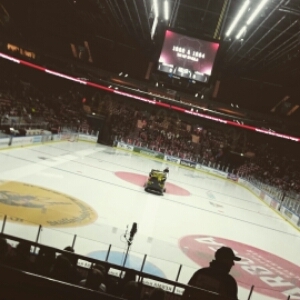 The ice hockey team in Malmö has been playing to reach the highest series this year, and since I want to be able to see my Gotham team down here, I have been cheering them on. 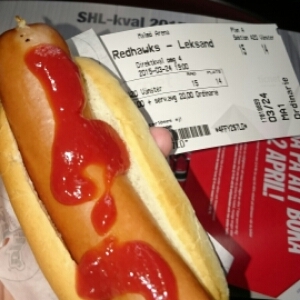 As my Gotham team was struggling away to reach the final, I needed a dose of some real hockey rather than the TV version, so I headed to the stadium to partake of a standard hockey meal, i.e. hotdog. I might have spent more time on my phone trying to follow the live score of the Gotham game than watching the game in front of me. Anyhow, both teams won their games. Whoop! Whoop!